SewIconz is unlike our other software. After the initial installation and the setup are complete, it requires no further user interact to perform its tasks. It is a class of software known as an icon handler, which means it interacts with the Windows© Operating System rather than directly with the user. After SewIconz is installed, you need to configure it by double-clicking its desktop icon to select the file types to iconize. This will open the setup dialog shown in the figure below. 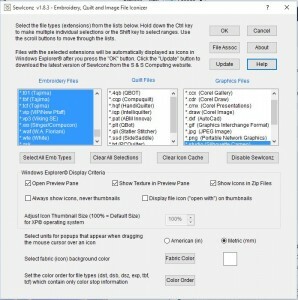 The setup dialog contains lists of embroidery and graphics file extensions (types) that you select to be handled (iconized) by SewIconz. Click on the types you want to iconize (hold down the Ctrl key to select multiple types). You may select the units (mm or in) for displaying file information. Also, for file types (like *.dst and *.exp) with no internal color palette, you can select the color palette by clicking on the Color Order button and following the steps on the palette dialog. You may also change the background, or fabric, color by pressing the Fabric Color button. This is useful, for example, when viewing white lace patterns which would otherwise be invisible on a white fabric background. Finally, press the OK button to complete the setup process. This is the last time you need to interact with SewIconz– until you want to change the types of embroidery and graphics files to iconize or to uninstall the application. You will be given the option to reboot your system at this time. Most modern operating systems do not need to do this, but on some older (XP) systems, you may need to reboot to see icons for the selected files. Once SewIconz has been installed and you have selected the various viewing options, you will now see “icons” (or thumbnails) displayed when you open a folder (using Windows File Explorer) that contains embroidery files (see the figure below). These images represent the stitch pattern contained in each file. 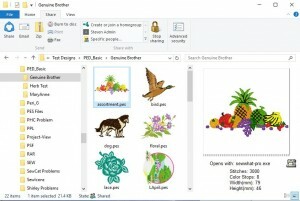 The figure shows an Explorer folder containing embroidery files with large-sized thumbnails displayed in the middle pane. The file “Assortment.PES” has been “selected” by clicking on it, and its magnified textured thumbnail is displayed in the right Preview Pane (available in VISTA and later versions of Windows). Q Does SewIconz work with VISTA and Windows 7/8? I installed SewIconz on my Windows 8 computer and the icons don't display - what did I do wrong? A Yes, SewIconz works on computers running VISTA and Windows 7/8. You must be sure to install the correct bit version - either 32- or 64-bit - corresponding to your computer's operating system. If you are not seeing icons after installing SewIconz, it is likely due to having installed the 32-bit version on a 64-bit system. Simply install the 64-bit version (download from the SewIconz64 link). If you still don't see icons, run the File Association cleaner file (as described above) and then reselect the file types. Q Should the "Always show icons, never thumbnails" option be checked? A Generally, this option should be left unchecked. If it is checked, you won't see folder icons displaying a preview of the files in your folders. Also, it may prevent certain built-in image types (jpg, etc) from displaying icons. You should check in Windows Explorer Tools/Folders Options/View to make sure that this option is unchecked there (SewIconz will try to set this option according to how you choose it). Q How do I determine if my computer operating system (OS) is 32-bit or 64-bit? A The easiest way on VISTA or Windows 7 systems is to press the Windows key (the one with the "wavy flag" logo) and the Pause key simultaneously. An information sheet will appear which displays System Information, including the bit-size of your OS. Alternatively, you can try to install the 64-bit version of SewIconz. If it installs, you have a 64-bit OS! If you have a 32-bit OS, the 64-bit version will fail to install, and you must use the 32-bit installer. Q After installing SewIconz and selecting the file types to iconize (by double-clicking the SewIconz desktop icon), only the icons for small views display properly. The medium and large (Tiles, thumbnails) views show up as black boxes or with "weird" icons in them. What is wrong? A This occurs because there are several settings in VISTA that can be used to block the display of large icons (thumbnails). To fix this, first open the SewIconz desktop application. Make sure the item "Always show icons, never thumbnails" is unchecked. Now click the OK button and check to see if your large icons display correctly. If thumbnails are still not appearing, then one more setting has to be adjusted. Go to Start->Control Panel->System & Maintenance->System->Performance Information & Tools. (This assumes you are using Control Panel Home View. In Classic View, click Performance Information.) Now click the "Adjust Visual Effects" link. On the "Visual Effects" tab, make sure the check box "Show thumbnails instead of icons" is checked. One of the two option "Let Windows Choose What's Best for my Computer", or "Custom", needs to be selected to be able to make this change. Q After setting a file association ("Open With") for an embroidery file type, the SewIconz icons no longer display for that file type and only the application icons show. How do I recover the SewIconz (pattern) icons? 1. Double-click the SewIconz desktop icon to open the SewIconz dialog screen and click the "Disable SewIconz" button. 3. Reselect the embroidery file types to iconize. Press "OK". Usually here is no need to reboot. Now your SewIconz (pattern) icons should be redisplayed correctly, and your file associations will be intact, too. If not, run the association cleaner file and redo steps 1-3. Q After setting the icon size in the current folder using the Window Explorer View menu, I navigate to a different folder and the icons are a different size there. How do I keep the same icon size for all folders without having to reset it each time the folder changes? 2) click the Tools menu, then Folder/View option. 3) click the "Apply to Folders" button to apply the current icon size setting to ALL folders subsequently opened. Now when you open ANY folder (of the same type) containing embroidery files, the icons should display in the size you have chosen. Q Some of my files display a red "X" instead of an image. What does that mean? A If SewIconz can not read one of the file types it was assigned to display, it assumes the file is corrupt and displays the red "X". If the Preview Pane is open (in VISTA/W7) and you (single-left) click the file, it will display a "Corrupt File" image in the Preview Pane. Note this doesn't mean the file is actually corrupt but only that SewIconz can't read its contents. Q Will SewIconz display icons in the VISTA/Win7-8 Details/Preview Panes? A Yes. To open the Details (Preview) pane, click (in Windows Explorer) Organize->Layout->Details (Preview) Pane. You can use these viewing panes to see an enlarged view of any embroidery (or image) file that you click in the Windows Explorer file pane. Q When do I need to open (double-click) the SewIconz desktop icon? A You only need to do that when you wish to change the choice of file types that should appear as icons, or if you want to change some viewing properties (such as the units displayed for the pattern properties which display when you hover your cursor over the pattern file icon). The first time after SewIconz is installed on your system you need to run the SewIconz setup dialog. Otherwise, the desktop icon for SewIconz can be ignored and just serves as a reminder that it is installed on your computer and handling the display of embroidery (and some quilt and image file) icons. It is so fantastic to see all thumbnails and to be able to find what you are looking for. It makes viewing embroidery files so much easier and enjoyable. It displays an enlarged view, the number of stitches, color stops, width, and height of the embroidery file in vivid color.